June, in an event that wanted to commemorate the "Pancasila" (the "Charter of the five principles") to strengthen solidarity among the various Indonesian communities. The Pancasila, official state ideology, is celebrated on June 1 each year. The first of the five principles of Pancasila is "to believe in one God": every Indonesian citizen has the right to practice the religion or faith he/she chooses, although the state officially recognizes Islam, Protestantism, Catholicism, Buddhism, Hinduism and Confucianism. Representatives of various communities and groups such as "Nahdlatul Ulama", the largest Muslim organization in the country, and "Pustaka Bergerak", a group that provides a network of mobile libraries, were present in the Cathedral for the iftar, a traditional dinner that stops the fasting. The leaders of the groups represented said that the meeting intended to show solidarity after the terrorist attacks in Surabaya, East Java, last month, which killed at least 23 people. "We were shocked by the latest terrorism in Surabaya, but with this meeting we are revitalizing a spirit of solidarity", said Father Hani Rudi Hartoko, parish priest of the cathedral of Jakarta, to Fides. Alissa Wahid, the eldest daughter of the fourth Indonesian president, Abdurrahman "Gus Dur" Wahid was also present. "This event was conceived after attacks in Surabaya and this meeting wants to show that Pancasila remains strong", he reiterated. The police confirmed that the attacks in Surabaya were carried out by members of the Jemaah Ansharut Daulah (JAD) group. "Terrorists will all go to hell, it is not true that they will go to Heaven after killing innocent people", said James Smith Carrington, known as Ustaz James, a member of Nahdlatul Ulama and "Majelis Ulama Indonesia". James explained that Islam has always respected diversity, in line with the Pancasila, reaffirming that the meeting was held to confirm this value. "Indonesia is experiencing an emergency due tointolerance: everyone believes they are right, as they begin to blame everyone else, contradicting what happened in the past with Prophet Muhammad and the Medina Charter," James said. The Medina Charter is an agreement established in the city of Medina in the seventh century when Prophet Muhammad welcomed people of other faiths, such as Jews and Christians, to freely practice their religions in Islamic territory. In another interreligious meeting, held at the Faculty of Theology of the "Sanata Dharma" Jesuit University, in the city of Yogyakarta, prof. Sumanto al Qurtuby, a Muslim professor of cultural anthropology, encouraged everyone to protect the diversity of the nation, noting that the growing radicalism in Indonesia is due to a misinterpretation of Islamic teachings, a lack of knowledge and a misunderstanding of culture, politics and Arab society. "Indonesia is our common home, and it is up to us to take care of it all together", said Sumanto, a professor at King Fahd University in Dhahran, Saudi Arabia. The event was also supported by "Banser", the youth wing of Nahdlatul Ulama. "We are worried about the current political situation in Indonesia especially in view of the elections, there are parties that try to politicize our diversity by polarizing society and raising barriers among communities", added Christ Amadea Esti, representative of the "Chattra kebaya" group, which promotes the defense of Indonesian culture and traditions. 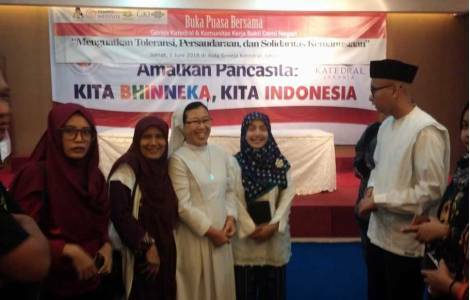 ASIA/INDONESIA - President Widodo to Catholic students: "Be agents of peace and unity"
ASIA/INDONESIA - 2018 "Year of Unity" in Jakarta, to "practice the Pancasilla"